Selima Optique Chad - Ryan Gosling - Crazy, Stupid, Love. Ryan Gosling wearing Selima Optique Chad sunglasses in Crazy, Stupid, Love. Ryan Gosling wearing Ryan Gosling wearing Selima Optique Chad sunglasses in Crazy, Stupid, Lovsunglasses in Crazy, Stupid, Love. Ryan Gosling wears a pair of Selima Optique Chad sunglasses in the movie Crazy, Stupid, Love. The glasses have a thick auburn tortoise frame, brown gradient lenses and two dots on each side of the front of the frame. 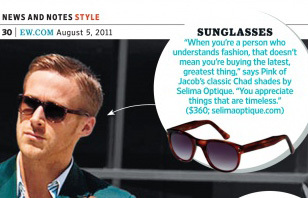 The glasses were mentioned in Entertainment Weekly (see screenshot). You can get the Chad sunglasses at any Selima Optique location, or online at selimaoptique.com (the Auburn Tortoise version is sold out but you can leave your name on a waiting list).